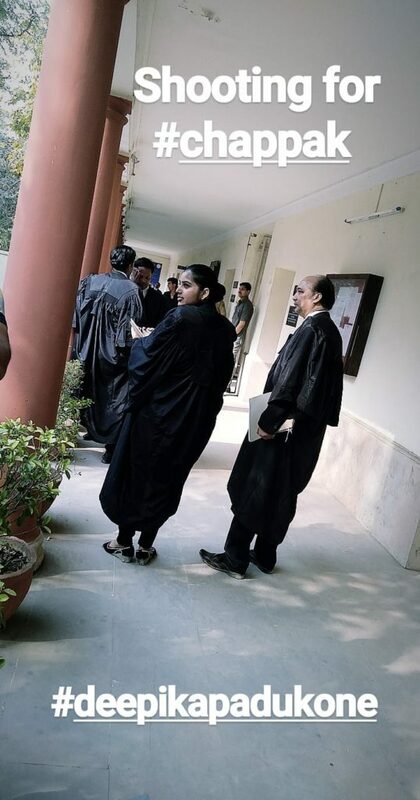 Actress Deepika Padukone was spotted shooting for her upcoming release ‘Chhapaak’ in New Delhi. The Diva who has been absent from the big screen since a year is back with a biopic on acid attack survivor Laxmi Agarwal. She was recently spotted in her getup of the acid attack victim that left many shocked with her uncanny resemblance to Laxmi. Fans were ecstatic to see her shooting in the capital city. Pictures and videos of Deepika as Laxmi has been viral on the internet ever since the actress started the shoot of the film. We now have a new picture of the ‘Padmaavat’ star breaking the internet. Dressed in a blue kurta the actress is all smiles on being caught on camera. Earlier too picture of Deepika mobbed by fans while shooting in Janpath had gone viral. In a video shared by a character actor on his Instagram handle the actress is seen dressed in a yellow kurta adjusting her scarf on her head. The said sequence seems to be a courtroom scene with many actors dressed as lawyers. Deepika Padukone is depicting the role of Laxmi Agarwal an acid attack survivor in the Meghan Gulzar directorial. The movie also marks her debut as a producer. The movie also features Mirzapur actor Vikram Massey in a pivotal role and will be released around January 20, 2020.